Mastermind by Creative Foraging Systems is an advanced foraging device for birds that require a more challenging foraging experience.The small heart shape is 7”x8”x3” and is made for small/medium birds. The use of foraging devices stimulates birds to search for food while engaging in rewarding, health activity. Foraging is a natural resolution to undesirable behaviors such as feather picking and excessive screeching. Made of tough polycarbonate to stand up to the toughest beaks. Turn tab on bottom to remove dowels for easy filling. Two toys in one! Can be a foraging toy and a chew toy. Sturdy polycarbonate foraging toy made for medium to large birds. Remove back of wheel and fill with your choice of food or treats. Mounts on cage with a mounting plate. Parrot must spin the wheel to bring each filled section to the recovery chamber. Machine washable. Macaws and medium Cockatoos as well as Amazons and Greys will love this wheel. Polycarbonate foraging wheel. Extremely rugged construction for big, tough parrots. Mounts vertically with access chamber on top. Remove back cover and fill with your birds favorite food or treats. Parrots must spin the wheel to bring each filled compartment to the recovey chamber. A challenging device for large parrots such as large Macaws and Cockatoos. Machine Washable. Made of lightweight, durable polycarbonate this 3.5” clear, slotted ball can be used in a variety of ways. Twist the halves counter clockwise add your choice of foods. toy parts, or noise makers. When used as a Foraging Toy: Fill with treats, fresh or dehydrated fruit, nuts, sliced veggies, large pellets etc. Place on the bottom of the cage or present out of the cage on a flat surface. Parrots will work at the openings to extract the food. When used as a Puzzle Toy: Fill with soft wood pieces, colored paper etc, and add a preferred treat. Search behavior will begin. Parrots will roll the ball around for hours to retrieve the contents. When used as a Noise Maker: Add a few medium size plastic beads or a bell, parrots will pick it up, shake it and amuse themselves for extended periods of time. Dishwasher Safe. Super durable polycarbonate foraging ball can be filled with food or treats. Easy twist open design. Foraging ball keeps bell safe and protected. This innovative hanging kabob serves as a foraging device as well as a kabob with a tray to capture pieces of food and reduce waste. Designed to make the acquisition of food or other contents more challenging. 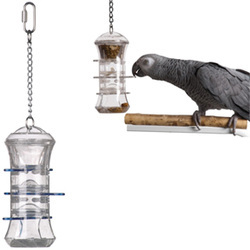 Ball is made of heavy duty polycarbonate and will withstand the pressure of most parrot beaks and will not break if dropped under normal conditions. 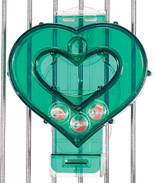 Ball spins freely and slides up and down on a stainless steel rod. Parrots can turn the ball or push it up to access portions of the contents. As the parrot attempts to extract the content from the gently swaying kabob, the difficulty level increases. 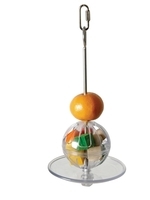 Stimulate inexperienced foragers by placing large pieces of fruit or vegetable on the skewer above the ball. Dishwasher Safe. Unscrew wing nut and fill top chamber with food. Wing nut must be completely tightened - spins with bottom paddles. Birds must continue turning the top wheel which rotates the baffles to release small portions of food in the recovery tray below. Great for medium sized birds like mini-macaws, small cockatoos, caiques, conures, amazons, pionus, quakers, senegals, greys, etc. Made of durable polycarbonate to stand up to tough beaks. Fill top chamber with food. Parrots must push and pull slats back and forth to release food into the chamber below. When food reaches the bottom access chamber, it may be retrieved. Machine washable. Great for Conures, Caiques, Pionus, Greys, mini-Macaws, Senegals, Quakers, Amazons & Cockatiels. Made of durable polycarbonate to stand up to tough beaks. Easy to use and clean; is dishwasher safe. Designed to make your bird work for food. Parrots must tip See Saw downward to release bits of food into the recovery area. See Saw automatically returns to original position. 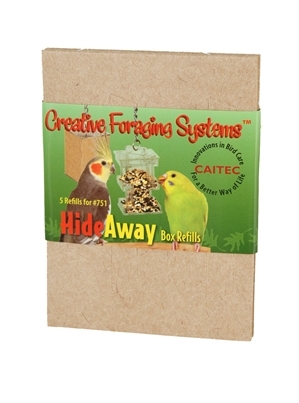 Great for medium sized birds from Mini-Macaws, small Cockatoos, Caiques, Conures, Amazons, Senegals, Greys, etc. Made of tough polycarbonate to stand up to tough beaks. Fill through hole on top. Parrots must tip device downward to move food or treats to the recovery chamber. Device automatically returns to its original position. The Buffet Ball is a cage mounted foraging device, with a 3 ½ inch, clear slotted ball made of heavy duty polycarbonate which under normal conditions will not break if dropped. Designed to make the acquisition of food or other contents both challenging and entertaining, the sphere spins freely and slides up and down on a stainless steel rod. Parrots can spin the ball or push it up to access portions of the contents. To minimize waste, a 5.5” circular tray below the ball collects removed pieces of food. Dishwasher Safe. parrot from removing the drawer but allows you remove it for filling and cleaning. Made of tough polycarbonate to stand up to tough beaks. 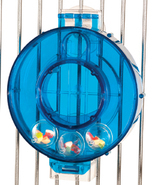 This highly interactive device provides entertainment for parrots and their human companions. Carousel bracket mounts on the side of the cage. Device is a six inches cross and houses four 2-inch square boxes. Lids on each box open differently and the entire device spins freely on the bracket. Parrots spin the carousel until the box containing the preferred food item is appropriately positioned. Bird must determine how to open the lid so that they can retrieve the food. Dishwasher Safe. 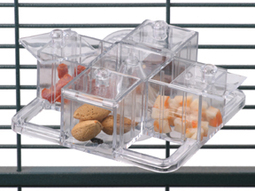 This device hangs in the cage and consists of three 2-inch pull out drawers located on 3 different sides. 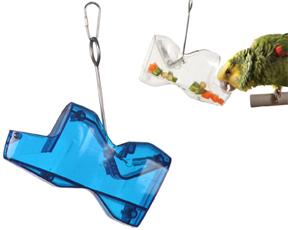 Made of tough polycarbonate to stand up to tough beaks.Parrots must open the drawer(s) to access the food or treats. Each drawer has a positive stop to prevent it from falling out or being easily removed by the bird. This device becomes more interesting when you add a different treat in each drawer allowing the parrot to make choices based on being able to see the contents. Or, hide a treat (a nut or piece of a favorite fruit) in shredded paper and stuff it into the drawer. Dishwasher Safe. 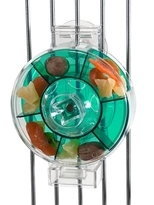 One of the only foraging toys specifically designed for smaller birds. To use: Slide the chipboard sleeve over the device. Utilize perforated holes to expose food or treat. Fill device with food. Hang in cage. Birds must chew through the paper to access the rewards. Refill chipboard sleeves available. Perfect for Parakeets, Cockatiels, and other small birds. Hanging treat box is made from “USDA approved”, human grade chipboard, an eco-friendly material.These boxes should be filled with your choice of food and/or treats. Parrots need to chew through the chipboard to get to multiple filled compartments inside. Good beginner foraging toy. grade chipboard, an eco-friendly material.These boxes should be filled with your choice of food and/or treats. 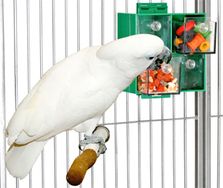 Parrots need to chew through the chipboard to get to multiple filled compartments inside. Good beginner foraging toy.